Includes 50 Floral Favor Bag Purse Boxes in blue purple orange and green comes with an instruction sheet for easy assembly. Party favor boxes come with a flower Design and they are self-locking. They come with Pearl Beaded handles for easy carrying and will match any color combo or event seamlessly. Includes 50 Floral Favor Bag Purse Boxes in blue purple orange and green comes with an instruction sheet for easy assembly. Party favor boxes come with a flower Design and they are self-locking. They come with Pearl Beaded handles for easy carrying and will match any color combo or event seamlessly. Includes 50 Floral Favor Bag Purse Boxes in blue purple orange and green comes with an instruction sheet for easy assembly. Party favor boxes come with a flower Design and they are self-locking. They come with Pearl Beaded handles for easy carrying and will match any color combo or event seamlessly. Includes 50 Floral Favor Bag Purse Boxes in blue purple orange and green comes with an instruction sheet for easy assembly. Party favor boxes come with a flower Design and they are self-locking. They come with Pearl Beaded handles for easy carrying and will match any color combo or event seamlessly. Tote your treats in style or add a little DIY flair and fill these versatile treat boxes with party favors. Bring these treat boxes to life with your own embellishments, glitter, markers and more! Great size! 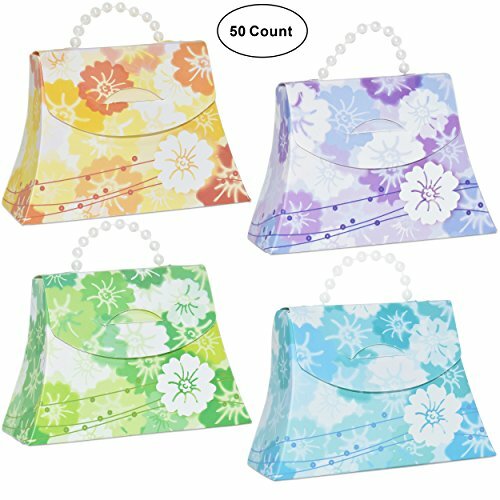 Each bag measures: 3 1/4" x 1 1/4" x 3"
Includes 50 Floral Favor Bag Purse Boxes in blue purple orange and green comes with an instruction sheet for easy assembly. Party favor boxes come with a flower Design and they are self-locking. They come with Pearl Beaded handles for easy carrying and will match any color combo or event seamlessly. Say your heartfelt thanks on point. Fill these white Favor Boxes with party favors, treats, sweets, confetti, candy, chocolate, mints, mementos, jewelry or charms and other gadgets to express your profound thanks to your guests! Set them at individual place settings at the wedding reception or use them on the candy buffet. They're also a sweet way to deliver small wedding gifts to your wedding party or special guests! Ideal for all kinds of parties: wedding Reception, birthday, baby or bridal shower, Holy communion, hen night, Christmas, Easter, Halloween, baptism, bachelorette party or other events! Tote your treats in style or add a little DIY flair and fill these versatile treat boxes with party favors. Bring these treat boxes to life with your own embellishments, glitter, markers and more! Great size! Each bag measures: 3 1/4" x 1 1/4" x 3"
If you have any questions about this product by Gift Boutique, contact us by completing and submitting the form below. If you are looking for a specif part number, please include it with your message.